Duno and Dhanda during Friday's weighin. 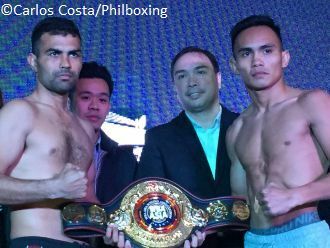 MANILA, Philippines -- WBA Interim Bantamweight Champion Reymart Gaballo (20-0, 17 KO's) of General Santos City scaled-in at 118.5 lbs while Japanese warrior Yuya Nakamura (9-2-1, 7 KO's) came one half pound heavier at 119 pounds for their non-title 10-round clash tomorrow Saturday (Feb 9) here at the Midas Hotel & Casino in Metro Manila, both fighters looking in excellent shape ahead of their main event rumble. The undefeated Gaballo, 22, managed by WBC Asian award-winning promoter JC Manangquil of Sanman Boxing, comes from a quick round one demolition of African boxer Julias Kisarawe last September in Manila; while Nakamura, 28, lands-in from a hard-fought majority draw last December in China, and who will prevail? Nakamura of Japan (L) vs Pinoy R. Gaballo for 10 rounds in the bantamweight division. 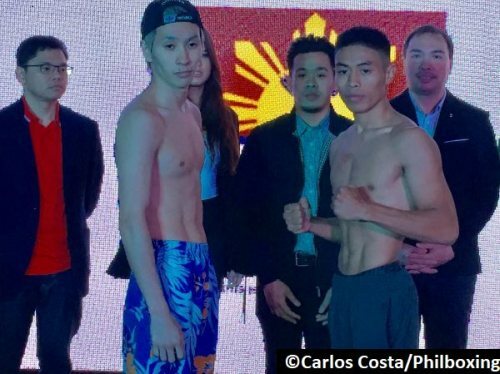 In the televised co-main feature, Sanman star "Ruthless" Romero Duno (18-1, 14 KO's) weighed-in at 134 pounds for his collision against Indian warrior, two-times Amateur National Champion Kuldeep Dhanda (7-1, 1 KO) in a battle for the vacant WBA Asia Lightweight crown. Smart tactician Kuldeep Dhanda -- whose trainer Roshan Nathanial is a winner the prestigious India's Bharat Shree Award -- was right on the money scaling-in without difficulty the limit of the light weight division, 135 pounds. The war's winner will claim the coveted shining WBA Asia champion belt, plus a place in the WBA world-rankings. The 23 year-old Duno is back in his native Philippines after a series of wins in California. Will he keep his success rolling hot? Or will Dhanda stop him? Also in an intriguing, well-matched collision between young Cotabato boxers, the "Doberman" Dave Apolinario (9-0, 6 KO's) of the Sanman Stable came-in at 111.5 lbs., while "The Hammer" Romshane Sarguilla (7-1-2, 4 KO's) made 112.5 pounds for their 8-chapter saga in the flyweight division. Both fighters come from impressive wins, and want more. R. Sarguilla 112.5 (L) battles Dave Apolinario 111.5 in a 8 round non stop action war. Also, unbeaten Presco "Carjun" Carcosia (4-0, 4 KO's) of General Santos City recorded 126 lbs., as his opponent, 7-year-veteran the "Amazing" Renerio Arizala (13-8-2, 5 KO's) of Bacoor, Cavite stepped-in at 127 pounds for their action 8-rounder. Will the young gun overpower the more-experienced warrior.. or will it be the other way around? In addition, unbeaten "Iron Fist" Jerven Mama (8-0-1, 5 KO's) of General Santos City, a young gladiator of the Sanman Stable, tipped the GAB scale at 112.5 pounds while tough-as-nails 23 year-old Mervin Lulu (5-4-2, 2 KO's) of the Municipality of Bagumbayan in Sultan Kudarat came in one pound heavier at 113.5 lbs. Their 6-rounder rumble that might not make it the distance. 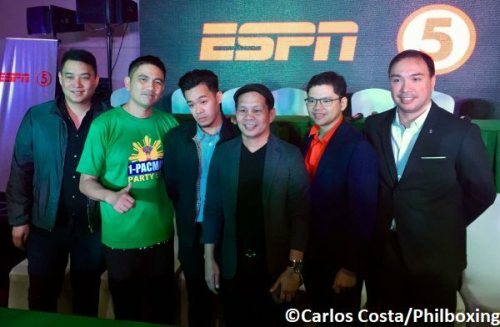 Sanman Promoters and GerryPens Promotions pose with ESPN 5 Head Lloyd Dennis Manaloto and GAB Chairman Baham Mitra Friday afternoon in Manila. 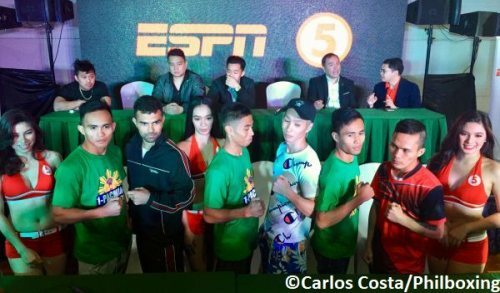 Boxers pose with their respective opponents during presscon Friday Afternoon at Midas Hotel & Casino in Metro Manila. In another exciting clash, unbeaten Sanman fighter Rolando "Momoy" Servania (7-0, 3 KO's), brother of world-ranked featherweight Genesis Servania stepped-in at 122 pounds while his southpaw foe Arnel Caoctoy (6-6-1, 2 KO's) of the seaside city of Ormoc in western Leyte came-in two pounds heavier at 124 lbs. 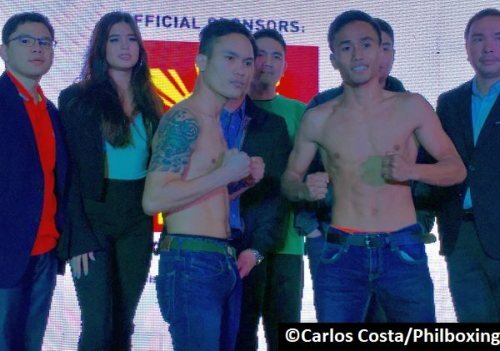 Caoctoy was given time to shed those extra pounds as their six-stanza battle at a contracted weight of 122 lbs. After some sweating, Caoctoy reduced one pound, being his official weight 123 lbs. The official weigh-in ceremony was supervised by Games & Amusement Board (GAB) Chairman Baham Mitra with the assistance of GAB Boxing Chief Dioscoro B. Bautista and GAB officials Rafael "Ralph" Dyoknos, Eduardo Coronel and Jan Keener So. This exciting Saturday card in Manila, headlining Romero Duno of the Philippines vs Kuldeep Dhanda of India for the WBA Asia Lightweight Title is a production of young Award-winning promoter JC Manangquil of Sanman Boxing Promotions in association with the Midas Hotel & Casino and ESPN5 Philippines. Matchmaker for the event is WBC Asia Award Winning promoter Brico Santig of Highland Boxing. Undercard fights start at 5 PM. Exciting Live Coverage of main bouts air on ESPN5 starting at 7 PM. The author Carlos Costa is a Panama-born fight reporter living in Cebu, Philippines. Carlos can be reached by email carlos512@hotmail.com and whatsapp +639184538152.